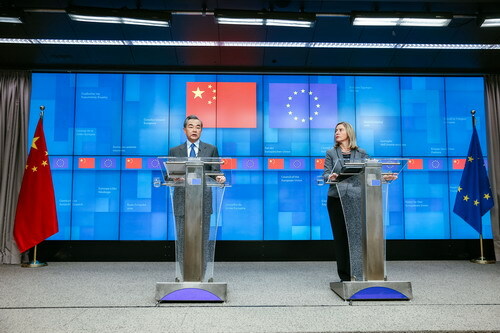 On March 18, 2019 local time, after the talks with the European Union (EU) High Representative for Foreign Affairs and Security Policy Federica Mogherini, State Councilor and Foreign Minister Wang Yi told the press that choosing Europe as President Xi Jinping's first overseas trip this year fully shows the great importance China attaches to Europe. Italy and France are important EU members, and the upcoming visit will be a moment of highlight in the diplomatic relations between China and the EU this year. 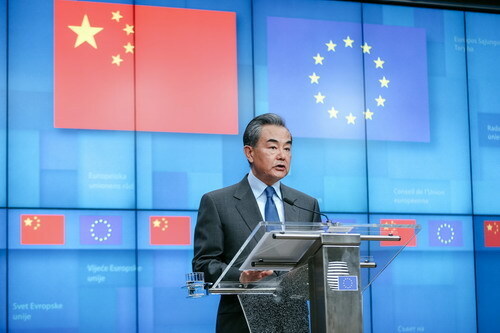 Wang Yi pointed out that head-of-state diplomacy plays an important strategic leading role in China-EU relations. President Xi Jinping's visit this time sends a clear message that, regardless of changes in international circumstances, the Chinese side always regards the EU as an important partner for strategic cooperation, and takes its relations with the EU as a priority in its foreign relations. We expect that the spring of 2019 will become a warm spring of China-EU relations and that China-EU cooperation will inject warm current into the world in 2019. Wang Yi stressed that China's respective relations with France, Italy and Monaco have withstood the tests of transformations of international situations, have stood out as examples of friendly cooperation between countries of different systems and are characterized by strategic, stable and long-term significance. President Xi Jinping's visit coincides with the 55th anniversary of the establishment of China-France diplomatic relations and the 100th anniversary of the work-study program in France. Next year marks the 50th anniversary of the establishment of China-Italy diplomatic relations. The visit to Monaco will also be the first trip by a Chinese president to the country, which demonstrates China's long standing view that all countries are equal regardless of their size. The three-country European visit will be a journey to consolidate friendship, deepen cooperation and engage in strategic communication. Wang Yi said the influence of President Xi Jinping's three-country visit will reach Europe. First, it will provide fresh impetus for China-EU comprehensive strategic partnership. Second, it will inject stability into today's fast changing world and contribute positive energy to safeguarding multilateralism. Third, through the integration of the construction of the Belt and Road Initiative with the Europe-Asia connectivity strategy of the EU, the visit will boost the connectivity of the Eurasia and boost the sustainable growth of global economy.